Today group stage World Cup match between Japan and Senegal, which ended in a 2-2 draw, wasn’t exactly a world-class showcase of skill and talent in the way that later rounds of the tournament will be. But damned if it didn’t have a boatload of charisma, which made it infinitely more entertaining than a 1-0 slugfest between giants might have been. The goals came from a mix of good play and mistakes, and Japan in particular struggled at times to get shots off. But these were two immensely likable teams, relatively unfamiliar to an international audience, and they put on a motivated, compelling performance for a Sunday afternoon. The scoring kicked off pretty much by accident. Ten minutes in, Senegal’s Youssouf Sabaly fired a shot from a bad angle on Japan goalkeeper Eiji Kawashima. Kawashima, a bit stupidly, punched the ball directly into the juicy rebound zone instead of trying to gather it or move it out wide, and it went directly off the knee of Sadio Mané and in. Japan responded with a beautiful goal from Takashi Inui in the 34th minute. On a long ball into the box, Yuto Nagatomo had a perfect first touch, which got picked up by Inui. Inui took a moment to set himself, fired a perfectly curved ball into the lower right corner, and we went into half all tied at one. That goal didn’t do anything do dampen Senegal’s belief that they could take all three points from this match. They came out the second half on the attack, and in the 71st minute, their aggression was rewarded with a goal from Moussa Wagué. Inui almost scored another brilliant goal when he hit the frame on a tricky angle, but the game would swing one more time, thanks to the left foot of Keisuke Honda. 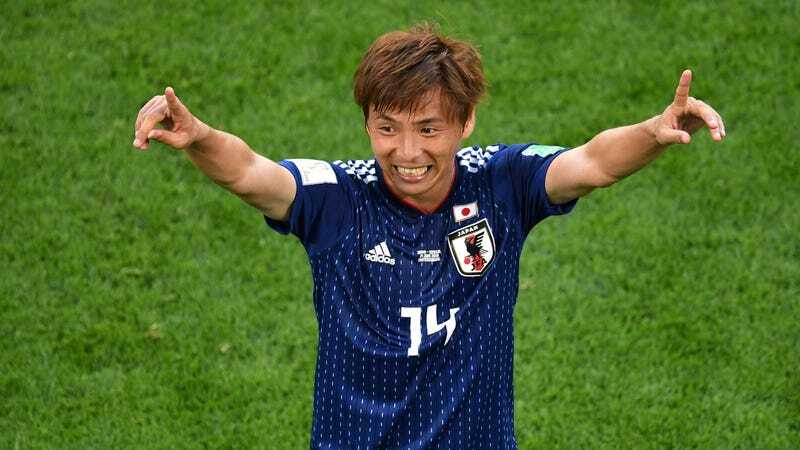 The 32-year-old in the twilight of a stellar career came off the bench for Japan, and took advantage of some miscommunication between the Senegal defense and their keeper to score an easy tap-in with 12 minutes remaining. This has been a really good World Cup so far—the Germany-Sweden and Switzerland-Serbia matches of the past couple days have been recent highlights—and I don’t mean to sound like a soccer plebe whining about a lack of goals or an abundance of flops. But especially relative to something like Brazil’s 2-0 win over Costa Rica—where the losers held a draw until stoppage time despite not getting a single shot on goal—this was a dang good game. Even if the defense wasn’t always up to snuff today, seeing two optimistic teams go for all three points without packing it in around their own net is always fantastic. A draw meant that neither Senegal nor Japan could punch a ticket out of the group stage yet, but both of them deserve to give it a go in the knockout round. What Do You Buy Online vs. in Stores?